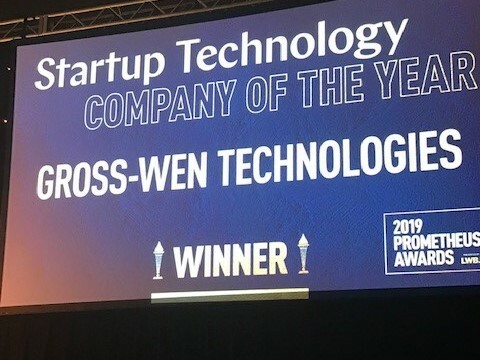 DES MOINES, Iowa — Ames-based startup company, Gross-Wen Technologies (GWT), was named the Startup Technology Company of the Year during the Technology Association of Iowa’s 2019 Prometheus Awards Thursday night. The Startup award recognizes an early stage technology company that has demonstrated significant market potential, creativity and a promising future. GWT is working to solve one of the world’s largest problems — water quality. Founded in 2014 by Dr. Martin Gross and Dr. Zhiyou Wen, GWT uses its patented wastewater treatment technology, called the Revolving Algal Biofilm (RAB) system, to recover nutrients such as nitrogen and phosphorus from wastewater. State and federal mandates passed in recent years will limit the amount of nitrogen and phosphorus that point sources, such as wastewater treatment plants and industrial facilities, can discharge in their effluents. GWT’s RAB system, based on technology developed at Iowa State University, provides Iowa municipalities and industries a means to cost-effectively, and sustainably address new wastewater permit requirements. In a follow up statement, Gross said he is from a small Iowa town and is particularly proud that his company offers an Iowa-grown solution to address new wastewater permit requirements. GWT made its first sale to the small community of Slater, Iowa in December 2018. Gross said the Slater installation will be deployed next week. “To start, we are focused on Iowa’s small, rural communities as our target market,” Gross said. “They will be most affected by new discharge limits as they struggle to find and pay for new water treatment options. Having to raise residents’ water and sewer rates to cover costs could prove detrimental to these small communities. A great way to drive people out of town is to make it too expensive to live in town. GWT’s process has been approved by the Iowa Department of Natural Resources (IDNR) and shown to be an effective, safe and reliable option to treat wastewater. Gross added that, not only is having access to clean water both an environmental and public health necessity, clean waterways also provide Iowans more opportunities for recreation, sports, and an overall better place to live. “It means a great deal to me personally that our solution offers small, rural communities the opportunity to meet their clean water needs and thrive. I look forward to what the future holds and am really excited to start deploying our technology to address Iowa’s water quality problem,” Gross said. GWT is a member of the ISU Startup Factory’s inaugural cohort that graduated in June 2017 and is part of the Ag Startup Engine. GWT’s offices are housed at the Iowa State University Research Park. Other finalists for the Startup Technology Company of the Year award included Denim, Firefly Photonics, Gain Compliance and MakuSafe Corporation.